The story of Iphithi Nature Reserve is an inspiring one, and tells of how a small group of residents changed a 9 ha piece of ground, abandoned by local government and overrun with invasive trees and shrubs, into an urban wildlife sanctuary. One of four areas shortlisted for the 2011 Mayoral Biodiversity Award, Iphithi began its transformation in 2000 when an advert was placed in the local newspaper inviting all interested parties to take part in a discussion on the banks of the stream; the topic: the potential future of this piece of land as a Nature Reserve. As romantic as this may sound, the stream was in fact a mere trickle, and the stream banks were overgrown with bug weed, American bramble and other alien plants, or, under the towering exotic Pines, Camphor’s and Wattles, completely denuded of all vegetation. These thirsty trees left no water for other plants to drink, the under canopy was sterile where no indigenous plant would grow and the invading creepers and shrubs had smothered what was left of the natural flora. Of course this meant there were no habitats for local bird, butterfly and other species, and as it degenerated, it became a local dumping site. The municipality added their share of rubbish, for when the bridge over the freeway close by was being upgraded, much of the unwanted rubble found its way here and some of it can still be seen down one of the slopes. In the late 1950’s the last portions of the farm belonging to the Gillitts family was sold off to developers who designed and built the suburb of Gillitts and this piece of ground was one of a few green areas included in the design of the township. But, left unmanaged, the alien plants invaded and the natural wetland in time began to dry up. With thirsty trees and no undergrowth, there was nothing to protect the river banks during peak rains and flooding of the reserve, roads and properties on its edges, was frequent. By the time the Reserve was constituted in 2000, the stream had eroded to 3m below the normal surface level. In 2001 all of the exotic trees were felled and planked, earning the Reserve funds from which to pay 2 full time labourers to keep the re-growth of the exotic species in check. With the area now open to sunlight, many exotic seeds still lurking in the soil profile grew rapidly, adding to the cost of alien eradication. The value of this approach was soon visible though; it took 2 weeks for the stream to flow again, and the water entering the area was now able to flow through to the wetland. It didn’t take long for the local pioneer species to colonize the area and as the number of plant species gradually increased so too did the animal life it supported. These pollinators brought in seed from other areas close by, adding more species to the rapidly growing list, and the natural eco-systems began to take shape. The badly eroded stream above the wetland was still a problem, and so a shallow dam was built in an attempt to bring the eroded stream banks back up to the original floodplain level. 12 years on and the wetland has at least doubled in size and the dam is gradually silting up and has stabilized the area, both up- stream and down -stream of the dam. A wide range of habitats have evolved depending on localized micro-climates and topography: wetland, stream, forest, wetland forest, grassland, open water/dam, and thickets. An equally diverse range of animals inhabit these areas, from bush buck, blue duiker, genets, mongoose species, as well as bird, butterfly, invertebrates, reptiles and other nunu’s that would naturally occur in the wider surrounds. During peak frog season, a walk through the Reserve is at times deafening! Peak rains now merely spread out across the wetland, protecting the properties and roads below, an indication that natures’ processes are working the way they were designed to do. Iphithi Nature Reserve is a favourite venue for birders and bird ringing is often done there, and the wide range of easily accessible habitats makes it a great venue for students and Environmental clubs to do outdoor studies. Many local residents take their daily constitutional along the 3km of pathways that wind through all habitats and across a long boardwalk, built over the widest part of the wetland. It is also one of the few natural areas where one is able to walk dogs, but always on a leash to protect the wildlife, and the dam is a lovely family picnic and light fishing venue. At the entrance to the Reserve generous donations have enabled a gazebo with braai facilities and a wooden deck to be built with a lovely view over the forest and dam, and a wheelchair ramp winds down from the car park to the deck. The extent of the Reserve has also increased with a number of residents pulling their fences up the slope, increasing it from 9.2 ha to about 12 ha. It is important though to strike a balance between human enjoyment of the Reserve, and its primary role as a wildlife sanctuary. It sounds as if it is all done and dusted, but it is an ongoing project kept alive by a very small group of volunteers. The money earned from the logging ran out after 2 years, such is the cost of the very labour intensive work of alien eradication. With not one cent being offered by the Durban Municipality, its survival, and that of the flora and fauna that have found a home here, is entirely dependent on donations. We are lucky enough to have a few local residents who donate monthly, but this still does not cover the cost of our 2 gardeners, so we host a few fundraisers to top up the kitty – Sundowners Strolls, Frog, Snake and Bat talks by local experts, and Music around the Dam is in the planning stages. The concept of one large fundraiser had been fermenting for a while, and the idea of the naked calendar spilled from a few bottles of red uncorked at one of our meetings in early 2011. It was only through the generous donation of time and expertise from a local photographer and graphic designer that the calendar saw the light of day at all. And for those courageous and committed enough to have stripped down to our most vulnerable state, it was an experience we will never forget, will always be immensely proud of – and would do again in a heartbeat! The idea of our vulnerable states reflecting that of our planet gave the photographs a spirit that is almost tangible. But make no mistake, we had enormous fun! And the results speak for themselves – it is a really beautiful calendar. Showing a tad more skin than the brave ladies who inspired us, and with a few males thrown in for entertainment, this is a calendar like no other. So don’t lose out – buy yours today, and, in keeping with its spirit, join your local Conservancy, Nature Reserve or any other Wildlife organization and do your bit – each person’s actions will make a difference. Editor and writer, Anno Torr, is a passionate lover of South African flora, a passion that has evolved into a deep concern for the survival of our floral heritage, the environment they inhabit and the organisms they co-exist with. This on-line gardening magazine has grown out of this concern, and aims to share knowledge, opinions and ideas whilst encouraging the use of South African plants in our gardens. Begun in September 2011, the magazine originally had a typical website design but significant increases in downloading speeds allowed the launch of its new digital page turning format in January 2012. The broad aim of The Indigenous Gardener is to foster the understanding that the natural systems that work to keep our environment in balance are as important within our gardens as they are within our last remaining natural areas. Whatever our preferred design style, whether a wild garden or the more traditional ‘tidy and pretty’ garden, it is possible to achieve it in a sustainable manner that will help to create wildlife habitats and corridors of connectivity between urban gardens and our cities’ wild open spaces. Articles focus on all aspects important to garden eco-systems, from creepy crawlies, fungi, reptiles, birds, butterflies ‘n bees, to garden design, indigenous plants, soil structure, climate and sustainable gardening practices. For only R170 per annum, South Africa’s only indigenous gardening magazine is accessible from the website. Click on the Magazine tab on the top menu bar. Short publications of the January – April issues are available for preview on the Home page. Anno is also the Chairman of Iphithi Nature Reserve, a 12 ha urban reserve on the doorstop of her home in Gillitts, Durban, and is a member of The Botanical Society of South Africa and Kloof Conservancy. 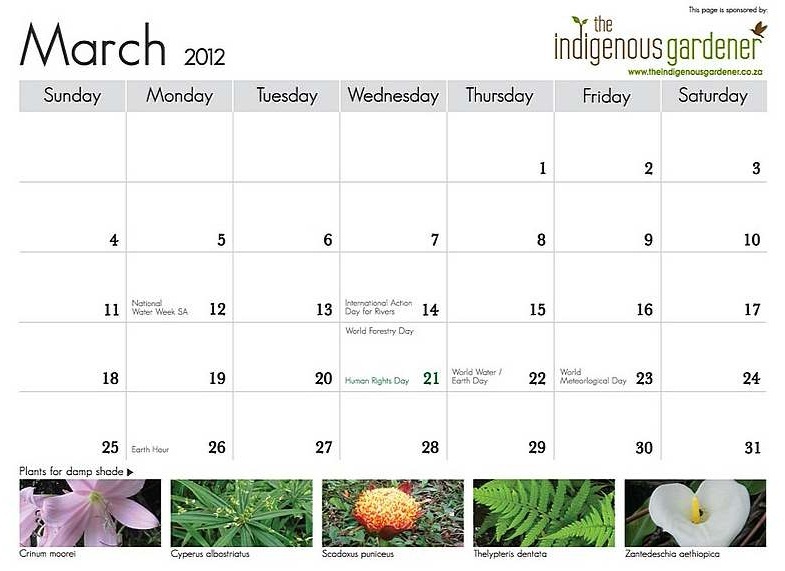 The Wildflowers Of Ipithi calendar is now available for R50. Including postage they are R60 each. For more info email Anno or post a request on Iphithi’s Facebook page. What a beautiful success story! Thank you to those who had the courage to make this happen!